Second, Own YOUR consequences and only yours. And this may mean that you have to STOP owing everyone else’s. Then it’s time to take a look at WHY you’re choosing it. You may think that you’re not choosing it, but at the end of the day, you’re committed to it at some level. And you may say, no…but I’m committed to him or her, and our relationship. However, is this really a relationship, or is it YOU trying to change someone else so YOU can be happy. If someone needs to change for YOU to be happy, then it’s time for you to change. Become the leader in your own life. Own your own happiness and consequences to the choices you’re making. If you feel as though you must be unhappy to be in this relationship, then you must ask yourself if this is what you choose. You can choose happy, and if YOU no longer fit in the relationship because you ARE happy, then be willing to see it as it is. And is it possible that you’re choosing to blame it on someone else? If you’re unhappy, it’s your responsibility to do something about it. Not someone else. But you may say, but what if they don’t change? Yes, there will be consequences for this, but they’re not YOUR consequences. Make YOUR choices and OWN your consequences, no one else’s. When you do, you won’t have time for that. 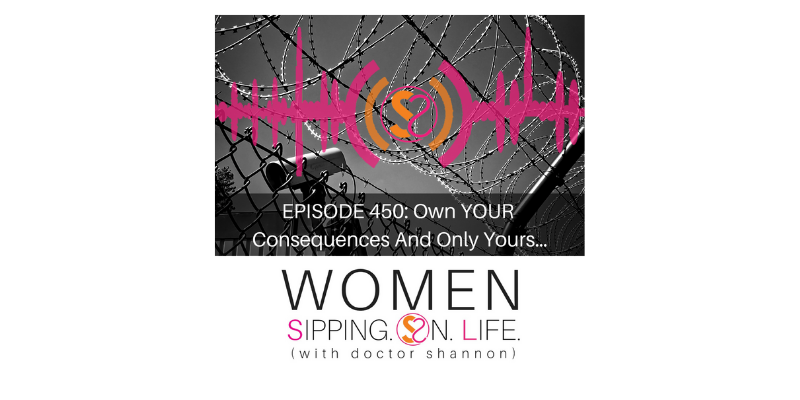 Perhaps you’ve been so distracted by someone else’s unhappy consequences that you’re now taking them on as your own, and it’s keeping you from OWING YOUR OWN CONSEQUENCES. For example, the consequence (or result) of the decisions that YOU’RE making. Not the consequences that someone else is creating. That’s not only called enabling, but it’s called YOUR CHOICE to give someone else your ability to choose another way. If something in your life’s not working, then make a choice to do something different. Even if it means doing something that’s unfamiliar and uncomfortable. At the end of the day, YOU have the power to choose your attitude, your gratitude, and your actions. You have the power to choose to CHOOSE. Remember that not choosing is also a choice. OWN YOUR CHOICES AND OWN YOUR OWN CONSEQUENCES. Be true to yourself, and you’ll become your true self. This is the consequence (result) of living in truth. There’s no other alternative, unless you’re choosing someone else’s consequence(s). Where are you paying the price of your own happiness for someone else’s debt of consequences?